A spacious and comfortable studio apartment in a private condominium at Dona Ana, Lagos with fabulous views of the sea and town. Now with Air Conditioning, Cable TV and Wi-Fi Internet access and laptop. 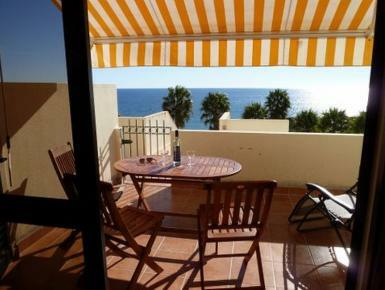 The apartment has fabulous views overlooking swimming pool Dona Ana and sea views beyond. It has one double bed, a kitchenette and a bathroom allowing it to accommodate two comfortably. Theres access to the superb pool, tennis court and the beautiful beach of of Dona Ana.